This is the last day before the registration rates for the Compassionate Boldness conference increase by ten dollars. Come and hear James White speak on the Trinity! 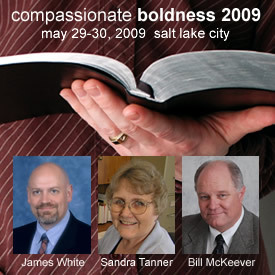 For a list of speakers and rates, visit CompassionateBoldness.com. Also, the MP3-CD of the 2008 talks is now $29. The individual MP3s from 2008 conference are available for $1.99 each. Note: Some people are being confused by the second prompt to register as a user on the web site. For the sake of simplicity, as you checkout the items in your cart, choose the “guest” option (instead of registering as a user). Registering for the conference is not the same as registering as a user on store.mrm.org.